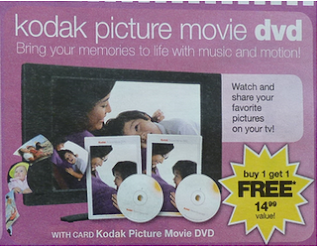 My Bargain Basket: CVS: Two FREE Kodak Picture Movie DVD's! NOTE: You will need to create this DVD in store at the Kodak Kiosk. You will need about 40 pics on a camera card, thumb drive, or DVD. *This is nearly a $30 freebie and would make a great gift for Mother’s Day!